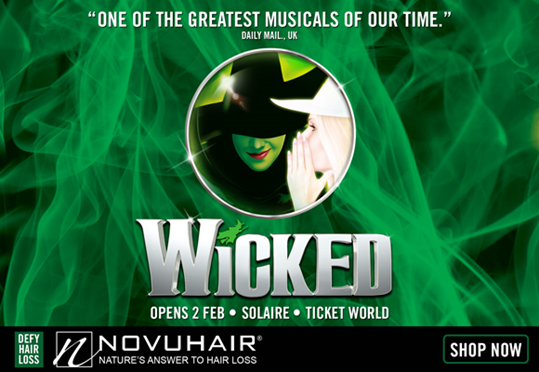 NOVUHAIR® – Nature’s answer to hair loss supports, “WICKED”: The Award-Winning Broadway and West End Musical will be opening soon on February 2, 2017 at The Theatre at Solaire Resort & Casino. “WICKED” is “one of the greatest musicals of our time”, according to Daily Mail UK is finally here in Manila to give musical fanatics the experience to “Defy Gravity”. Spectators from the country will surely enjoy the fantasy world of witches, wizard, magic and spells. “WICKED” will be having seven-week run starting February 2, 2017 until March 12, 2017 so that more audiences will get the chance to witness this exciting musical. Novuhair Topical Scalp Lotion is available as an individual purchase; as part of a combo pack that includes Novuhair Herbal Shampoo and Topical Scalp Lotion; or a 3-in-1 pack with Novuhair Herbal Shampoo and Conditioner and Topical Scalp Lotion; and a 2-in-1 plus one with two Novuhair Shampoos plus Topical Scalp Lotion, all in 200 ml bottles. Available in all Mercury Drug outlets, Watson’s branches, and other leading drug stores. For more inquiries, please call 413-6570 or 0922-8830575. Aside from the telltale signs like split ends and dry and brittle strands, and DIY hair checks you may do at home such as tug and knot tests, determining the true health of your hair and scalp may call for something more complex. Nowadays, with the advent of scientific and technological advancements, equipment and diagnostic tests for examining the hair and scalp up close are available in dermatological clinics. These allow for a closer inspection of the hair and scalp to detect problems that are not visible to the naked eye such as pore obstruction, overactive secretion of sebum, dandruff, dry and/or flaky scalp, inflammation, and other issues. The folliscope is an automated handheld apparatus with a microscopic camera that connects to a computer via USB. 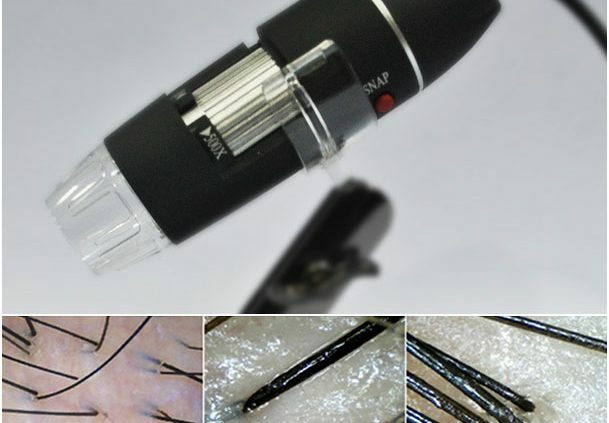 It shows a clear and high definition image of the scalp and hair and saves the captured real-time digital images, which may be used as reference for further testing. Hair and Scalp Analyzer Systems These are complete computerized software and equipment that performs a series of thorough visual and direct analysis on the hair and scalp. 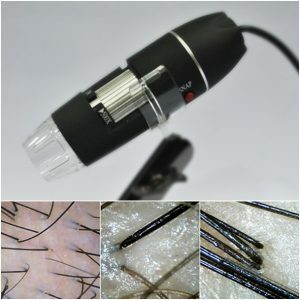 It also measures hair density, hair shaft diameter, hair growth, sebum rate and meter, among others. Usually, these diagnostic tests also include dietary and lifestyle investigations to gauge what other factors may be contributing to hair loss or poor hair health and determine the appropriate and necessary treatment. Good news for those who want to have their hair and scalp checked! NOVUHAIR®, nature’s answer to hair loss, offers a free analysis for its loyal users and interested customers in line with its program of promoting healthy hair and scalp awareness. 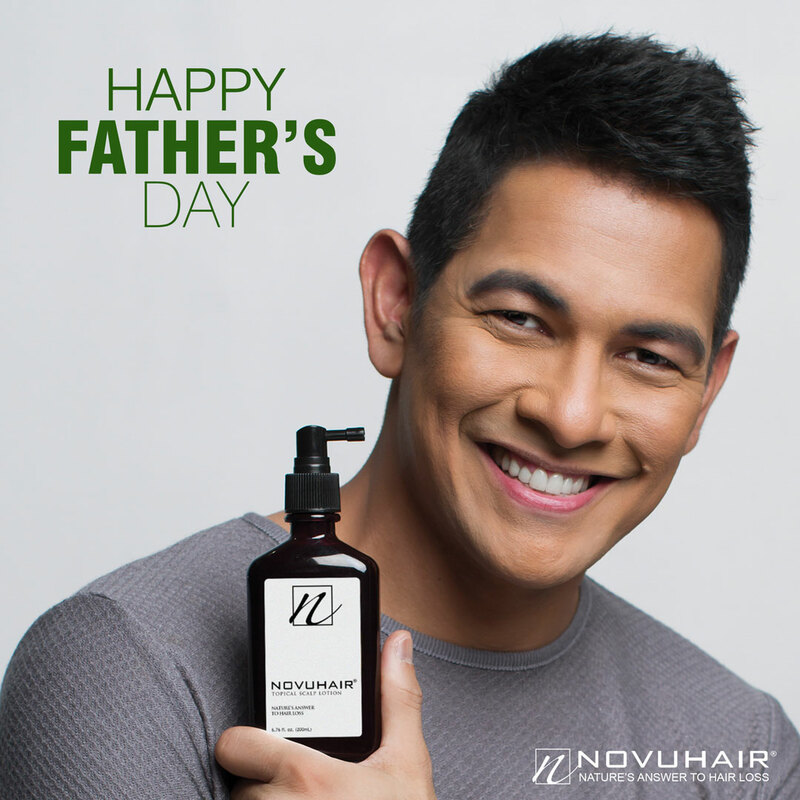 Just visit the NOVUHAIR® booth in selected Mercury Drug, Watsons Personal Care Stores in Metro Manila and Cebu City for a free hair and scalp analysis. Existing NOVUHAIR® users may grab this opportunity to check the result of their NOVUHAIR® usage and check the progress of hair growth. These data are then stored in a database for future reference and monitoring. For more information on selected locations and schedules, visit www.novuhair.com or contact the NOVUHAIR® hotlines at (02) 413-6570 or 0922-8830575. September marks the month-long commemoration of alopecia areata awareness worldwide. Leading this year’s celebration in the country is Alopecia Philippines, a group founded by singer and songwriter Abby Asistio in 2012. Abby is no stranger to alopecia, having been diagnosed with alopecia areata since she was four years old. Alopecia areata is described as an auto-immune disorder that results in partial or total loss of hair on the head and other parts of the body. Abby’s decision to come out in public with her condition was a major turning point in her life. “It was a very big step for me. And I was amazed at the response I got from both my friends and random people who said my story had touched and inspired them,” Abby reveals after talking about her condition on national TV back in 2008. Fast forward to September 2012, Abby decided to start an online campaign in time with Alopecia Awareness Month by inviting family and friends to pose with the double “A” (inverted “V”) sign using their fingers on the photo sharing site, Instagram. It quickly caught on and Abby was overwhelmed by the response from netizens, with over a thousand photo contributions to date. 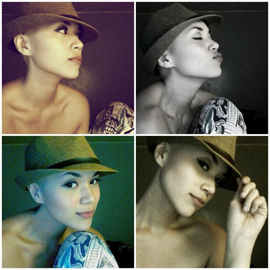 This paved the way for the beginnings of Alopecia Philippines. It aims to raise awareness about alopecia and correct common misconceptions and perceptions about it, provide encouragement to people afflicted with it, and create an online support community for them. Inspired by Abby’s transparency and courage, men and women, kids and teens from different walks of life began sharing their own stories and struggles living with alopecia. What started out as a group of ten is now more than 100 members strong and its Facebook page – Alopecia Areata Awareness, draws followers from all over the world. The group regularly organizes information drives about alopecia through different platforms– benefit concerts, symposia, and multimedia testimonials, among others. It has earned raves and waves of admiration in and out of social media for their confidence and pride in embracing their life with alopecia. Singer-songwriter, TV host, Novuhair brand ambassador, and the poster girl for alopecia in the country, Abby Asistio is singing a happy tune nowadays. And it’s all because of those precious new strands of hair which are obviously growing on her previously bald head. Abby proudly shows off her head with its short hair, like a child showing off a prized toy. “It has consistently been growing longer these past two years. My hair is significantly thicker now and I could already style it in different ways, even without having to wear wigs, turbans, and other hair accessories,” she shares with an obvious gleam of joy in her eyes. It seems like a miracle, those delicate black strands of hair growing from her scalp and for Abby, the sensations are almost all new to her. “I never thought I could have a full head of hair again. I could actually “take care of my hair” now and even go to the salon to get a trim,” she says enthusiastically. “I love having hair again,” she further states. Abby’s secret? Novuhair, nature’s answer to hair loss, which she has been using for more than 2 years now. “I use the scalp lotion, shampoo, and conditioner religiously,” Abby continues. Having alopecia is a huge part of Abby’s life journey and after successfully recovering from it since being diagnosed at the age of four, she has made it her mission to help others afflicted with the same condition. She started by putting up the first support group in the country – Alopecia Philippines, which aims to spread awareness about the condition and at the same time, inspire and motivate those with alopecia to become more secure and comfortable in their own skin. “It’s never easy,” Abby says about living with alopecia. “But remember, you are not alone. People around you love and care for you, and accept and appreciate you for who you are. Look for someone to talk to, a shoulder to cry on, people to laugh about your journey and hair stories with,” Abby further shares. Novuhair Topical Scalp Lotion is available as an individual purchase; as part of a combo pack that includes Novuhair Herbal Shampoo and Topical Scalp Lotion; or a 3-in-1 pack with Novuhair Herbal Shampoo and Conditioner and Topical Scalp Lotion; and a 2-in-1 plus one with two Novuhair Shampoos plus Topical Scalp Lotion, all in 200 ml bottles. Available in all Mercury Drug outlets, Watsons branches, Lazada online, and other leading drug stores nationwide. For more information, call 413-6570 or 0922-8830575 and visit www.novuhair.com. Like us on Facebook: Novuhair Official and follow us on Twitter:@NovuhairNatural. Want to treat your locks to some extra special lovin’? Head on over to the hair stylist of the stars – THE Jing Monis. His eponymous salon, with three strategic branches in stylish places over the metro, offer complete hair styling services with highly-trained and accommodating glam team. And the best thing about this salon is Jing’s individualized approach to hair styling. 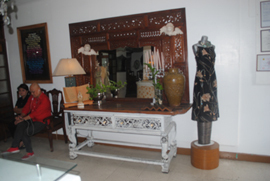 Jing believes in “giving each woman an individual look that personifies her lifestyle. The right haircut always makes a person stand out from the rest,” he says. 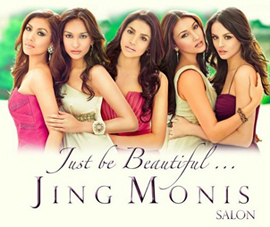 So every time you come out of a Jing Monis Salon, you can be sure you’re looking your fabulous best! Try their Vanilla Bean Hair Treatment, a moisturizing treatment most suited for dry hair and scalp that’ll leave your mane smelling wickedly delicious for days on end. With an unblemished career spanning more than 20 years, Jing Monis continues to make a name for himself as one of the best hairstylists in the industry whose clientele includes top magazines, photographers, models, advertising agencies, celebrities and socialites, to name a few. If you want to experience first-hand his magic touch and get a ‘do that’s really suited for you, book an appointment now and get ready to be glammed up! Top hair and make-up artist to the stars and fashion designer Fanny Serrano’s eponymous salon moves to a bigger and swankier space at 32 Scout Borromeo St., Tomas Morato, Quezon City. They are offering additional beauty services to complete the pampering experience this new year. For details, check out the salon cheat sheet below! The Lowdown: Everything you need for a beautiful and stylish day is here. It’s a one-stop-beauty-shop especially for brides and debutants offering gown designing, formal wear, hair and make-up services and even jewelry and other accessories. No need to book separate designers, make-up artists, hair stylists, and worry about getting stuck in traffic while rushing from one beauty appointment to the next. To book “the” Fanny Serrano himself, call ahead of time and look for Beth, his personal assistant. What’s New: Beat those mid-week stress with their basic facial starting at Php399.00. Or splurge a little and indulge in some luxury facials with mask starting at Php880.00 for platinum or collagen mask and gold mask at only Php990.00. They also offer Diamond Peel at only Php500.00. September marks the month long commemoration of Alopecia Awareness worldwide. To culminate the month-long celebration in the country, Alopecia Philippines partnered with Novuhair for the #Beautiful Project Workshop held last September 28, 2014 at The Vault Manila, from 5:00 to 9:00 P.M. Led by Alopecia Philippines founder, Abby Asistio, the event was designed to bring together people afflicted with alopecia and provide an avenue for the free-flowing exchange of information, sharing of experiences, and create a support system for everyone in the community. With the help of Novuhair, nature’s answer to hair loss, #The Beautiful Project featured a talk on alopecia by renowned doctor, Dr. Cecilia Catapang. Abby, who’s also a Novuhair brand ambassador, gave a moving testimonial as to her journey to hair loss and eventual slow recovery from hair loss, thanks to Novuhair. Attendees to the event were also treated to fun, games, and prizes courtesy of Novuhair, wigs from Lynelle: House of Hair Fashion, through the assistance of Ms. Jennifer Sevilla, and rousing performance by Aia de Leon of Imago. Next year, Alopecia Philippines, together with Novuhair, hopes to reach more Filipinos in its goal of educating them about alopecia and empowering those who are already living with the reality of hair loss. Whether you’re meeting up with old school pals for that nth-year reunion, attending your company’s formal awards shindig, spending time with family for your annual Christmas lunch, or having dinner with the boyfriend’s family, sparkle and shine in this year’s Hollywood-inspired holiday hair styles. Take a page off the book of these stylish and elegant stars and flaunt your gorgeous tresses in these quick and easy ‘dos. Channel rock star/designer Gwen Stefani’s classic yet edgy bombshell look with long, soft waves. Ideal for those with long, layered hair, just make an appointment at your favorite blow dry bar or opt to DIY. To start, apply a volumizing mousse before blow drying your hair with a round brush. Then part your hair in the middle and softly run your fingers through it for a natural look. You may also use curlers to achieve the big waves. Spritz on some hairspray before heading out the door to keep your hair in place throughout the night. Bring attention to your blissfully glowing face and infectious holiday smile in this clean and chic updo. Just tie your hair in a bun and tease the crown a little. Clip on a pretty pin on the side or slip on a thin head band to add a little flair to your hairstyle, like the forever classy Charlize Theron. Surprise everyone by turning your straight bob into a head of romantic curls like actress Rachel McAdams. Simply blow dry your hair with big curlers on high heat then softly run your fingers through it after for an effortlessly natural finish. Apply some light hold spray and you’re ready to turn heads this season. The ponytail is classic ‘do that will never go out of style. Rather, it just gets reinvented time and time again. For this year’s holiday look, try actress Eva Longoria’s casual yet stylish high ponytail with a teased crown or opt for Beyonce’s sophisticated and sleek low pony. Remember, you don’t need a glam squad like these stars do to achieve that perfect holiday look. Just be creative and let your personality shine through in your hairstyle, clothes and makeup. It’s the season to be merry so go ahead, have fun and enjoy some holiday cheer. 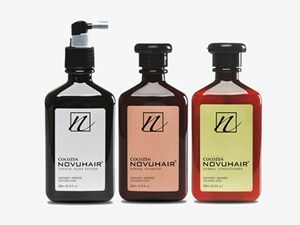 Good news for all Novuhair users! 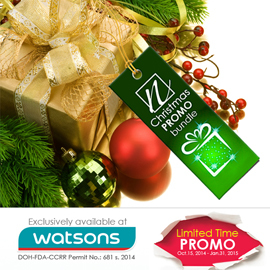 Enjoy an early holiday present with Novuhair and Watsons’ Christmas Bundle of Joy Promo from October 15, 2014 to January 31, 2015 in selected Watsons Personal Care Stores nationwide. For every purchase of the Novuhair 3-in-1 Pack or Novuhair 2-in-1 Plus One Pack, get a Porcelana Whitening Pack for free and save as much as Php815.00. The Novuhair 3-in-1 Pack contains one bottle each of topical scalp lotion, herbal shampoo and conditioner while the 2-in-1 Plus One Pack is inclusive of one bottle of topical scalp lotion and two bottles of herbal shampoo. Each free Porcelana pack contains one 200mL bottle of whitening lotion and one bar of whitening soap. With the Christmas Bundle of Joy Promo, nourish and protect your hair with Novuhair, nature’s answer to hair loss, and keep your skin brighter and younger-looking with Porcelana.